01. The Vice Chancellor, South Eastern University of Sri Lanka on behalf of Standing Cabinet Appointed Procurement Committee (SCAPC) invites sealed bid from eligible and qualified bidders as mentioned below for the following work. 02. Bidding will be conducted through National Competitive Bidding (NCB) Procedure. 03. To be eligible for contract award, the successful bidder shall not have been blacklisted and shall meet the requirement of (ICTAD) / CIDA registration as mentioned above. 04. Qualification requirements to qualify for contract award is as mentioned in Bidding Data Clause 4 in section II . 05. Interested bidders may obtain further information, if required, in this connection, at the office of the Project Manager / Works Engineer, South Eastern University of Sri Lanka, Oluvil (0672255356) and inspect the bidding document free of charge at this address during office hours from 9:00 a.m. to 03:00 p.m.
06. A complete set of Bidding Document in English language may be purchased by interested bidders from Deputy Registrar / Capital Works & Planning, South Eastern University of Sri Lanka, Oluvil on the submission of a written application addressed to Vice Chancellor, South Eastern University of Sri Lanka, with photocopies of the relavent pages of CIDA (ICTAD) record book and the receipt for the payent made, a sum of Rs. 45,000.00 as non refundable tender fee to the Shroff of this Univesity, at Oluvil from 08.02.2019 to 22.02.2019 during office hours from 09:00 a.m. to 03:00 p.m.
07. 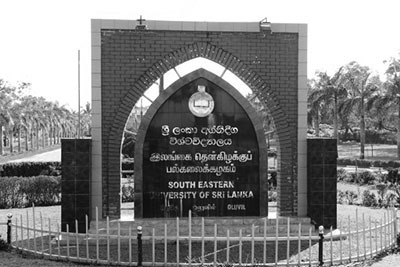 A Pre Bid meeting will be held at the Board Room of the South Eastern University of Sri Lanka, Oluvil on 25.02.2019 at 11.00 a.m. for the above work. 8. Bids shall be valid up to 119 days from 10.04.2019 which is the last date of submission of Bids. 10. Sealed Bids in duplicate shall be delivered as mentioned under Clause 20.1 of the Bidding Data in the Bidding Document (Director, Procurement, Ministry of City Planning, Water Supply & Higher Education, No: 18,Ward Place, Colombo - 07) on or before 10.04.2019 at 11.00 a.m. Bids received after the date and time mentioned herein will be rejected. Bids will be opened immediately after the closing of the Bids in the presence of the Bidders or their representatives who choose to attend.